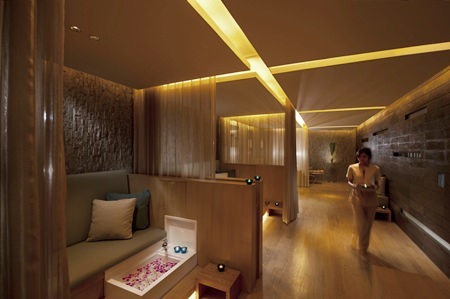 This issue our spa visit remains on the theme of luxurious hotels, especially ones with a nice beachfront atmosphere and we hope that our spa lover readers will not want to miss this one, especially ladies who love shopping as this spa is located next to a high-end beachfront shopping mall. 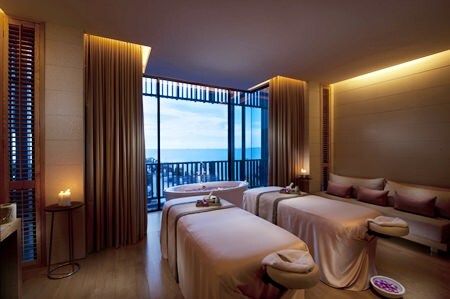 Hilton Pattaya is a five-star hotel that pays fastidious attention to every detail of its services, one of which I recently had a chance to experience, “eforea”, a simply luxurious spa on the 17th floor of the hotel. 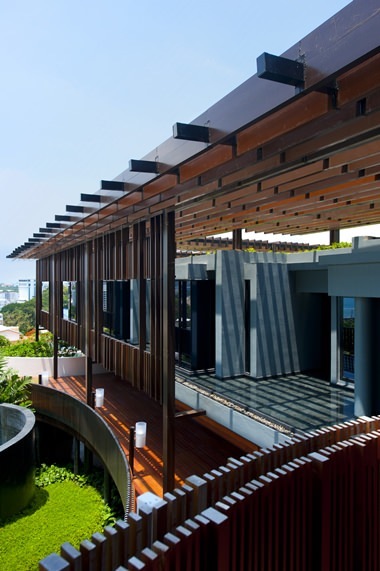 Despite being perched high up on the building, it still remains in our concept that focuses on spas with a beachside atmosphere, and though getting there involved changing elevators twice, which caused me a little confusion, it didn’t lessen my eagerness to try out the good things that awaited me. 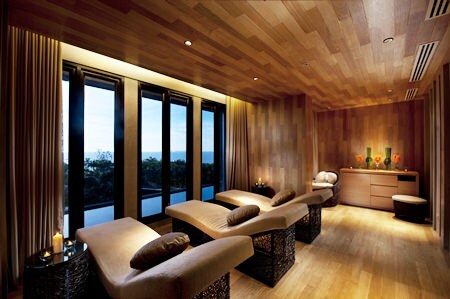 “eforea” spa features simple and stylish decoration and from every room it provides beautiful views of Pattaya bay. The total floor space of 880 square meters features seven treatment areas, all of which benefit from the integrated music and aroma diffusing system. It offers an exclusive treatment menu, innovative design features and carefully selected product partners that appeal to today’s savvy global travelers. 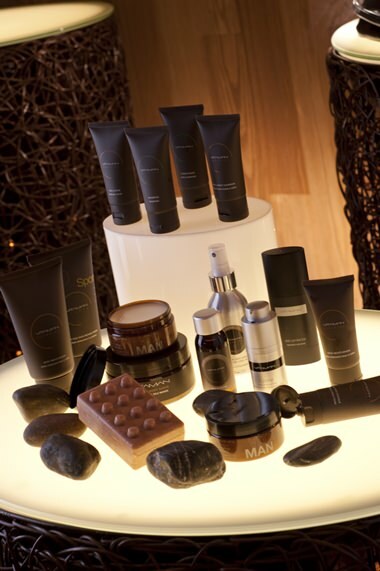 Products & treatments available include Essentials Journey (Kerstin Florian), Escape Journey (LI’TYA) and Men’s Journey (VitaMan). The massage techniques used at “eforea” are unique but what is more unusual than any other place is their “Escape Journey” massage, which is designed to induce calmness and rid you of stress. The process involves closing your eyes and meditating while spa staff perform an aboriginal Australian “smoking ceremony”, which involves smoldering leaves from special plants in a small fire. The therapist then walks to circle the smoke around you. The massage only starts once you are relaxed by the smell of the smoke and through meditation. The program that “eforea” presented on the day I visited was the “Face and Body Sensation”, which involved 3 hours of body massage and scrub from head to toe, starting with a herbal foot scrub in warm water followed by a the body scrub using customized products that were specially chosen for my particular type skin. I felt totally cleansed and relaxed after being meticulously scrubbed and massaged alternately. Following a quick shower I was then served with a glass of hot ginger drink to raise my body temperature before the massage. Although the therapist was only slight in build, she was able to administer strong and constant massage pressure to unfurl all those knotted muscles and she demonstrated a technique that could only be gained from good training. She swept her palms on my back in a figure of eight pattern and used her thumbs to press on various points all over my body to relive pain and stimulate blood circulation. The course was finished with a facial steam treatment that detoxifies the skin before nourishing cream is applied. Considering with the quality and services offered at this five-star hotel spa, the price of this course is very reasonable. This three hours treatment cost 6,400 baht per person and 12,000 baht per couple, with these rates being offered until the end of the year. If clients arrive early, they can use the sauna and stream room, or bathe in a Jacuzzi tub for unlimited time both before and after the treatment. They can also relax in a guest room facing the sea where hot herbal drinks are served. 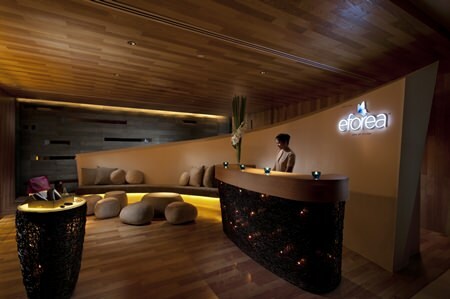 Hilton Pattaya has special promotions for anyone interested in subscribing for a one-year membership of the “eforea” spa. There are two prices, 7,500 baht and 15,000 baht, which include eforea’s signature treatment of 90 min Thai massage, 60 min body scrub, and 60 min meditation massage. 1 voucher gives 50% discount on any spa treatment. Additionally, the 7,500 baht membership comes with vouchers for 20% and 30% discount on any spa treatments, one voucher of each, while the 15,000 baht membership provides two vouchers of each discount, plus an extra free 60 minutes antioxidant facial treatment and a deluxe sea-view room for one night including breakfast for two persons. To find out more or for reservations, call 038 253 000, email [email protected] or visit eforeaspa.com. Note: Rungratree Thongsai graduated from the Taralai Thai Massage School with professional qualifications in Spa Management, Thai Traditional Massage, Original Western Technical Massage, Reflexology Foot Massage, Aromatherapy Swedish Style Massage, Body Spa, Body Lift-Up, and Business Management of Thai Massage. She also holds a professional spa certificate from the Ministry of Health and a Spa for Health operator’s license. Hair and nail salon area.